As Hillary Clinton made a powerful case for herself, Elijah Cummings made an equally powerful case against the committee’s hyper-partisanship. That is because the House also has a few exceptional members who step into the spotlight only when it is necessary—and who, when they take that step, bring a measure of honor to otherwise desultory affairs. Hour after hour, at each and every necessary point, Cummings intervened—with appropriate and righteous indignation—to challenge the excesses of his conservative colleagues. 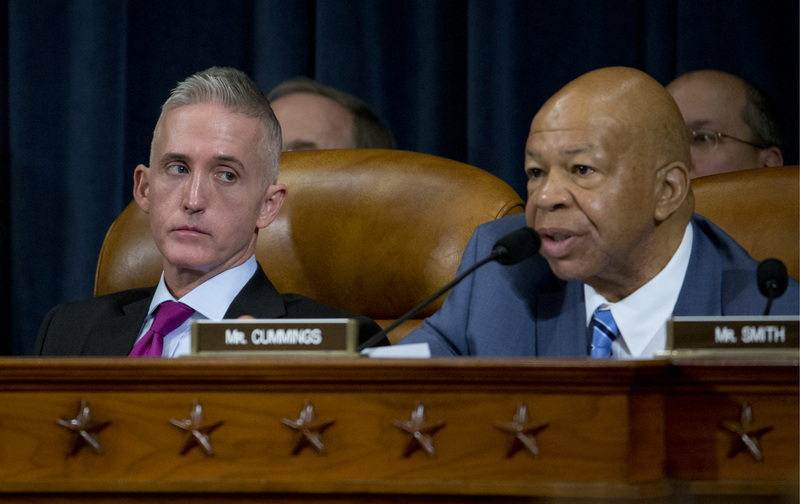 The questions from committee chairman Trey Gowdy, R-South Carolina, and his minions were for the most part repeats of discredited campaign claims. Never mind that the basic premises advanced by the Republicans Thursday were rejected by the American people in 2012. After hearing a steady stream of Republican criticism of the administration’s response to the tragic events that led to the death of US Ambassador to Libya Christopher Stevens and three other Americans, voters reelected President Obama and Vice President Biden with a 5 million popular vote margin and a 332-206 Electoral College landslide. Gowdy’s hearing developed such a sharp partisan edge that Pulitzer Prize–winning journalist Carl Bernstein compared the “reckless” and “abusive” questioning with the approach seen during the “red-scare” circuses organized by Senator Joe McCarthy in the 1950s. Clinton responded with a compelling and frequently poignant recollections of her State Department service in general and of her response to the Benghazi attacks in particular. So masterful was the former secretary of state’s testimony that, while it surely was not their intent, Gowdy and his minions ended up creating a day of theater that did more than any debate or campaign speech could to confirm Hillary Clinton’s readiness for the presidency. It is understandable that reviews of Thursday’s session will focus primarily on Clinton’s ownership of the day, and on the inability of Republican committee members to grab anything more than a few minutes of camera time. But some of the most striking presentations Thursday came from Democratic House members, such as Sanchez and Illinois Congresswoman Tammy Duckworth, and especially from Congressman Cummings, the ranking Democrat on the committee. A senior Democrat with decades of experience as a leader of the Maryland House of Delegate and the US House of Representatives, Cummings serves as the ranking member of the House Committee on Oversight and Government Reform, where he has ably managed the egos of current chairman Jason Chaffetz, R-Utah, and Darrell Issa, R-California. Cummings gets his share of attention, and respect. But as a veteran legislator who is committed to keeping the institutions of Congress functional and functioning, Cummings has looked for ways to work even with the most difficult partisans and to share the spotlight with members of his own caucus. Cummings has always been recognized for his legal and legislative skills. He displayed them on Thursday. Yet, he also displayed a passion that, in many senses, defined the day. Cummings defended Clinton. But he also indicted the Republican majority on the committee for engaging in excessive and irresponsible partisanship. I have great respect for the chairman, but on this score, he is wrong. In fact, it has been done by his own Republican colleagues in the House on this very issue—Benghazi. The Republican Chairman of the House Intelligence Committee conducted an extensive, bipartisan, two-year investigation and issued a detailed report. The Senate Intelligence Committee and the Senate Homeland Security Committee also conducted bipartisan investigations. Those bipartisan efforts respected and honored the memories of the four brave Americans who were killed in Benghazi: Ambassador Chris Stevens, Sean Smith, Tyrone Woods, and Glen Doherty. The problem is that Speaker Boehner did not like the answers he got from those investigations. So he set up this new Select Committee—with no rules, no deadline, and an unlimited budget—and he set it loose on Secretary Clinton because she is running for president. “These stark admissions reflect exactly what we have seen inside the Select Committee for the past year,” said Cummings. Just look at the facts: Since January, Republicans have canceled every single hearing on our schedule for the entire year—except for this one with Secretary Clinton. They also canceled numerous interviews that they had planned with Defense Department and CIA officials. Instead of doing what they said they were going to do, Republicans zeroed in on Secretary Clinton, her speechwriters, her IT staffers, and her campaign officials. This is what Republicans did—not Democrats. When Speaker Boehner established this Select Committee, he justified it by arguing that it would be “cross-jurisdictional.” I assumed he meant we would focus on more than just Secretary Clinton and the State Department. But Madam Secretary, you are sitting here by yourself. The secretary of defense is not on your left, and the director of the CIA is not on your right. That’s because Republicans abandoned their own plans to question those top officials. So instead of being “cross-jurisdictional,” Republicans just crossed them off the list. Cummings returned to these themes again and again through the 11-hour hearing. At times, he clashed with Gowdy. He defended Clinton. He defended Ambassador Thomas Pickering’s inquiry into the State Department’s response to the Benghazi tragedy. Even as he battled the beast of hyper-partisanship, Cummings never lost sight of a basic, and essential, premise. Hillary Clinton could not say that to the committee. But a distinguished and determined congressman could. And did.